Drivers will need some time to adjust to the new rules, but the project is off to a promising start. Many drivers ignored the new “no through traffic” signs along King. 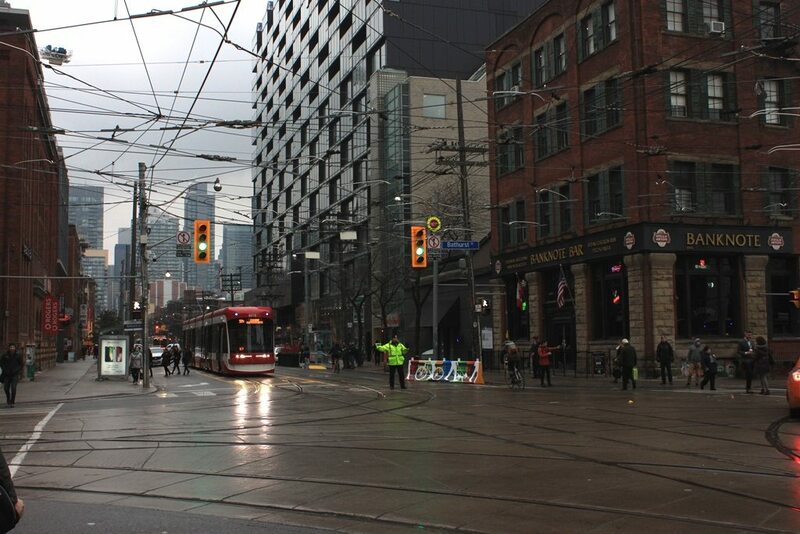 Toronto’s experiment to convert King Street to a thoroughfare where transit reigns began with a quiet launch on Sunday and this carried over into the morning rush hour on a partial bank holiday following observance of Remembrance Day on the weekend. 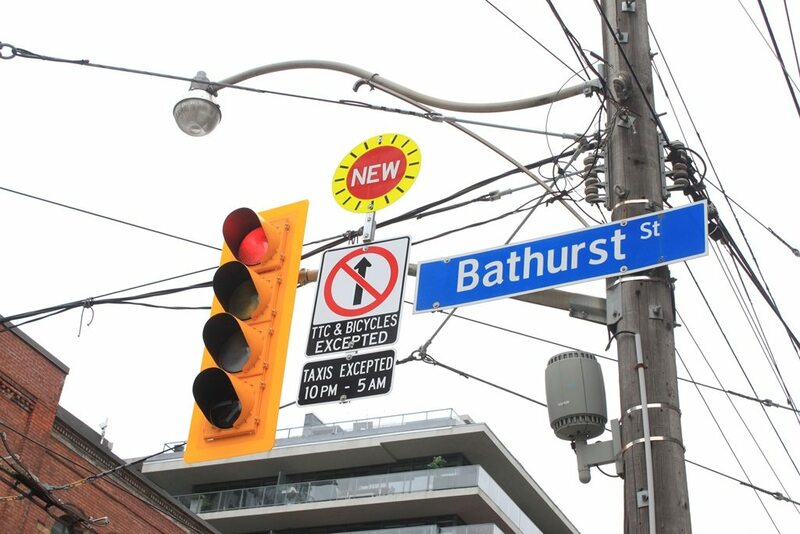 From Jarvis to Bathurst, traffic rules and lanes have been redesigned to favour transit, cycling, and vehicles that really have to be on the street—delivery vans and taxis—while discouraging trips by motorists just passing through downtown. With less traffic on King, traffic that remains should move faster and more smoothly. That’s the plan, although it will take some time to see how things work out under heavier demands on regular work days and when special events disrupt the downtown street grid’s capacity. The new arrangement officially began on Sunday, with all of the new traffic signs and signals unveiled and most of the new street furniture in place. At midday, with only a few police directing traffic and issuing warnings, Toronto got a first class example of how motorists ignore traffic signs. Some drivers obediently turned off of King where they should, but the majority sailed through “no through traffic” postings (a straight arrow in a barred red circle). “No stopping” areas were filled with parked cars, and even some “no left turn” signs were mere decorations to some motorists. Monday’s morning rush hour was lighter than usual because of the deferred holiday observation, but King Street was unusually quiet thanks to a combination of good police traffic direction and a lot of publicity keeping traffic away from the pilot area. One immediately obvious problem is that a “no through traffic” restriction is quite rare in Toronto, and motorists assume that a green signal means they can go straight ahead, even if not in any other direction. Much more prominent, preferably illuminated signs are needed to grab drivers’ attention just as the city already does with “no left turn” arrows at key intersections. The new rules will require ongoing enforcement, perhaps by the proposed traffic wardens. Active direction of traffic will be key at the entrance points to the pilot. On a drizzly Monday morning, a traffic constable at Bathurst gave no quarter, and waved off every vehicle that attempted a move banned under the new rules. This will be fine as long as it lasts, but the moment this type of hands-on management disappears, scofflaws will reappear in droves. This really is a job for TTC staff or Mayor Tory’s recently announced traffic wardens. The major change for transit riders, beyond hoped-for better service, will be the shift of almost all transit stops to the far side of intersections (the exceptions are westbound at Portland and at Bathurst which remain near side stops). The area for the stops is blocked off with Jersey barriers, and riders can board and alight from streetcars without worry that they will be mowed down by autos speeding past open doors. Transit stops have been re-located as part of the pilot project. 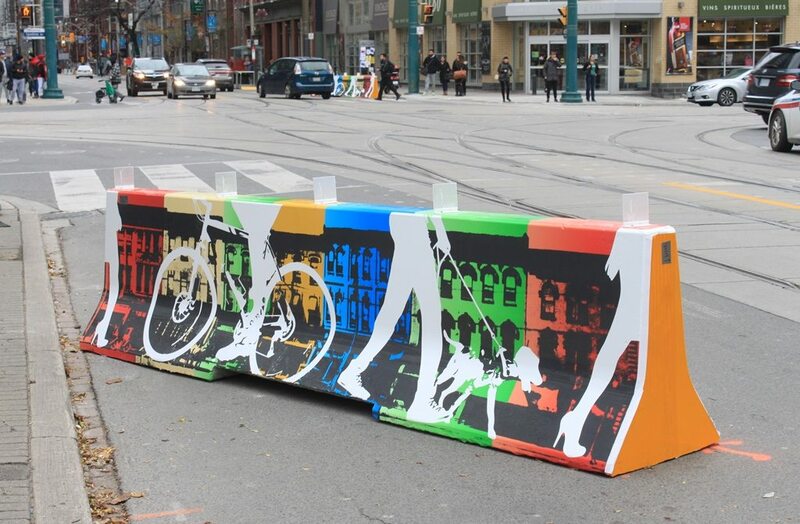 The barriers are decorated to give a more attractive view than the standard concrete block so familiar from construction sites. They are positioned to substantially block the curb lane while leaving cyclists room to pass without riding onto the streetcar tracks. Not just another concrete barrier. This one has art. 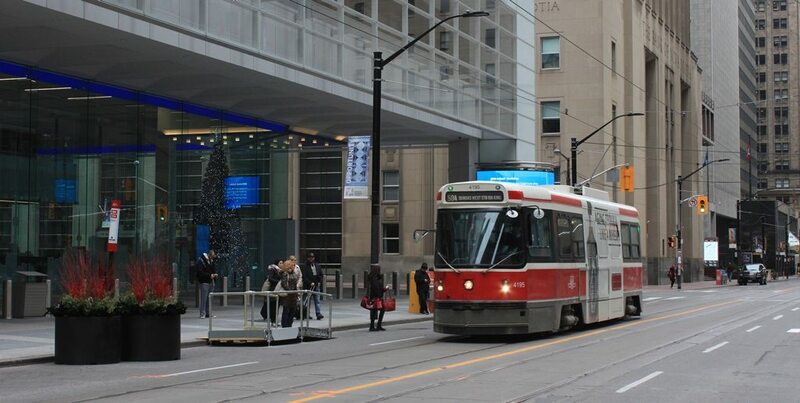 The 514 Cherry streetcar provides accessible service on this part of King, and the TTC plans to begin converting the 504 King service once Bombardier delivers more cars on its long-overdue order. Each new stop has a ramp down from the sidewalk into the protected curb area. 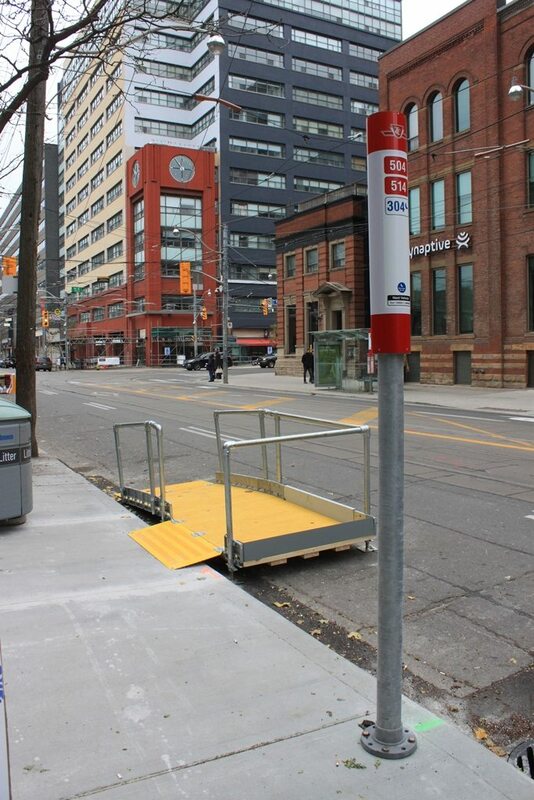 Though delayed, the new Bombardier streetcars will make the 504 route more accessible. Transit shelters at three stops—eastbound at Bathurst, Portland, and Spadina—were installed at the new stop locations, but in most cases existing shelters remain with their glazing removed. Two issues here must be addressed if the trial becomes permanent. First, a shelter cannot be mounted on the typical pavement in much of the core where there are tiles rather than a solid concrete pad (hence, no temporary shelters at most stops). 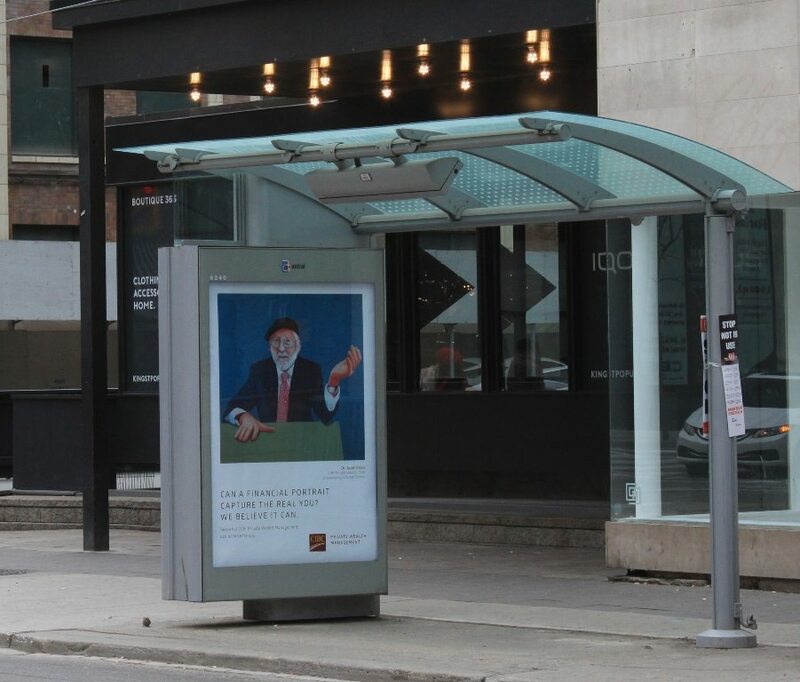 Second, the shelters are part of the city’s street furniture contract where the vendor receives income from the advertising. The ads will remain in place even if the stop locations change, at least while this is only a pilot. The old transit shelters pose something of a challenge for the pilot project. 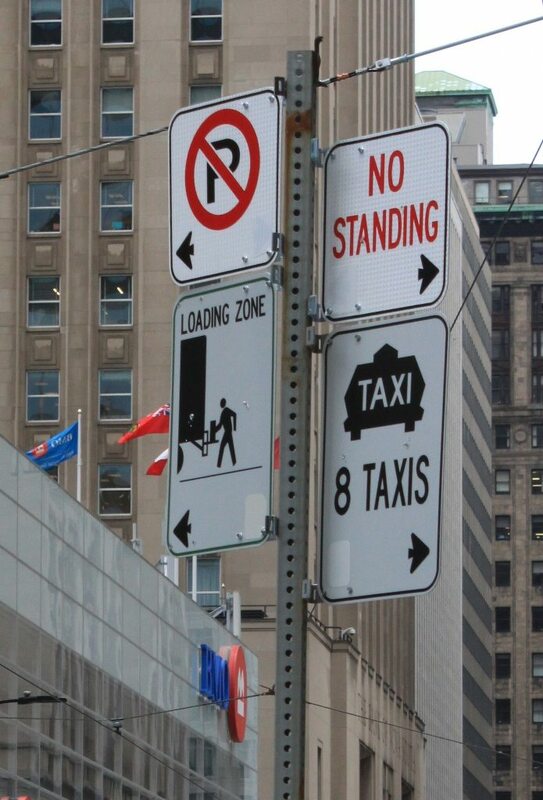 For motorists on King Street, much of the curb lane is taken up with specific uses including cab stands, loading areas for goods, and separate loading areas for passengers from tour buses or cars. These are located, to the extent that room on the street permits, in the areas where they are most needed. Some simple “no stopping” areas remain, but many of these will receive pedestrian-oriented improvements in the spring of 2018, and the curb space they occupy will no longer be available for traffic. The first rush hour’s operation saw streetcars rolling through downtown with few impediments, but they were still well loaded. The basic problem the TTC faces on King is that even under ideal conditions, the route is very well used, and the slightest disruption turns mere annoyance into intolerable service. Even on this comparatively quiet day, many were walking past streetcar stops where they could not board full cars. Two important changes will improve the situation. As more of the new double-length Flexity streetcars arrive from Bombardier, they can add to 504 King’s capacity by replacing existing cars one-for-one. The other change will be to shift the older “bendy” cars (the ALRVs) to 504 King from 501 Queen, and schedule Queen on the basis that the shorter cars (the CLRVs) will be used there. The 501 has suffered for some time with a service scheduled for the larger ALRVs, but substantially provided by shorter cars. The success or failure of this pilot will not be determined for some time as much remains to be studied. How does the street behave under more substantial traffic and pedestrian conditions, foul weather that snarls traffic and fair weather that brings out pedestrians in droves? How will parallel streets taking the traffic load behave? Will transit riding on King go up with a better, more reliable service? These are questions for the long haul, for the year-long project to determine if there is a better way to operate transit on downtown streets.